With your visit to our guesthouse and after taking some time to relax yourselves from traveling, local sites provide multiple ways for your pleasant stay at Prespes. Where ever you are travelling from, , here ( ) you will find all the necessary information for your pleasant stay at our guesthouse. The close area of Lake Prespes contains 2 lakes, small and great prespa. Starting out from our guesthouse,at the small village of Psarades and by first crossing the small mountain side, visiters first meet the small St George's chapel on their right hand with full view at the 2 lakes, great prespa on their left and small prespa on their right side. The location here contains perenial juniper trees which are in special conservation status. By following the downhill road, visitor reaches crossroad and on the lefte turn, in approximately 200 meters, the bridge of "Κoula" area is reached (Α route on the map available here) . Small observation point is located there for bird watching without being disturbeb by human presence. A stride by the beach of Lake Grea Prespa has much to offer to the visitor with plenty of view towards Skopje villages on the far side of the lake. If the visitor selects the right turn on the crossroad, (B route on the map available here), then and constantly having small Prespa lake on the left hand and reed areas soon, the traveller reaches the parking and and dock of Agios Axilios small island, where by the 800 meters floating footbridge. After a magnificent stride along the small island, visitors may continue on the way to Pyli village and after that, by crossing a beautiful forest route, the village of Brontero is reached with local people dedicated to simple life and sheep breeding. Prespes lakes offer many routes for hicking. For near by places, we propose a visit at "Roti" bluff by a half hour stride to it. In the end of it, a view point exists. The ideal time to be there is nere sunset. If visitors select to follow on this route, for experienced only, the path drives to Vrontero village by the back side of the mountain. Second proposed route is from our guesthouse and straightforward to the small chapel of St Athanasios only in half hour stride.For other locations please fell free in asking us for information. Prespes area is a paradise for nature lovers. Further information on location's wildlife can be reached here. Plenty of observation points exist on the route of A selection.Visitors may collect further information by accessing PRESPA NATIONAL FOREST MANAGEMENT BODY and by use of this map which contains marks of all area's observation points. Our Guesthouse services 2 boats (Pelekanos and Germanos) for your boat excursions at Lake Great Prespa. Beautiful images either by the daylight or by sunset in compination with nature and plenty of well cared old hermitages, comprise a pleasant way of relaxing. 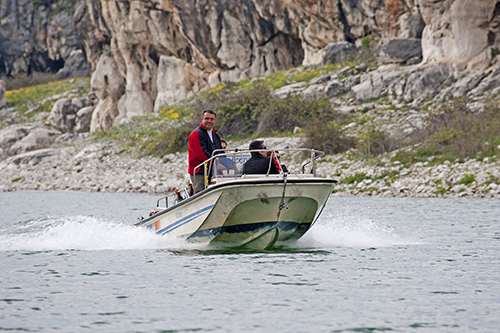 You may view here some photos from Great Prespa Lake excursions. Our selected paths are totally secured, tryied out and accompanied by experienced navigator, well educated about local area history and hermitages legacy. Furthermore, if you ask it in advance, we can take you to small beaches near the Lake at summer time for swimming. You may ask for more information a) Germanos 2385046107 & 6942503863 b) Arampatzis Basilis (Pelekanos) 6945744657 for schedulling your boat excursion. After early schedulling, for experienced and patient visitors, we can take you with us on boat fishing areas. By participating in the procedure of fishnet let and collection, visitors learn by first hand the local fishing traditions. For this you should be early wakeing up. If you really want it, fell free to contact Germanos. You may view here a small slide show of people's fishing daily work. Prespes area does not offer extreme night life. However, some cafe and bars service are found in the villages of Agios Germanos, Psarades, Laimos and Kallithea. 30.07.2012 2 + 1 days in our guesthouse Select your stay during 1 Sep till 20 Oct 2012 and for two days stay we offer 1 day more free of charge. Πρότυπο σχεδιασμού από Sadhana Ganapathiraju.